Coordinating funding and cooperation across agencies led to unique public infrastructure results. The Lexington Downtown Streetscape Master Plan established a strategy and guidelines for the incremental transformation of Downtown Lexington’s public realm. The goal of the plan is to restore a pedestrian-friendly and inviting environment to the Downtown district’s streets and public spaces. The master plan created better connected urban spaces within Downtown and the adjoining neighborhoods through the development of a “Complete Streets” strategy. Traffic modeling and roadway modifications were part of the "Complete Streets" initiative that introduces new bicycle facilities, bus and trolley stops, on-street parking, and loading spaces throughout Downtown. The design of underground utilities, curb alignments, and signal infrastructure supports the future conversion of one-way streets to two-way while reducing the overall width of pavement cross-sections. Implementation focused on streetscape improvements and green infrastructure along major downtown roadway corridors, the renovation of Cheapside Park, and construction of the new Market Pavilion, a covered performance, outdoor dining, and event space. Completed on a rigorous schedule, the $17 million project involved state and federal funding as well as substantial coordination between the local client, KY Department of Highways, and Federal Highway Administration. Construction administration services included consultation with local, state, and federal officials responsible for evaluation of an FHWA “Right-to-Experiment” associated with a “Floating Bike Lane” along one of the corridors. The transformation of the downtown streetscape provides additional space for trees, wider sidewalks for cafe seating, reduced width of roadways, and increased inventory of on-street parking. 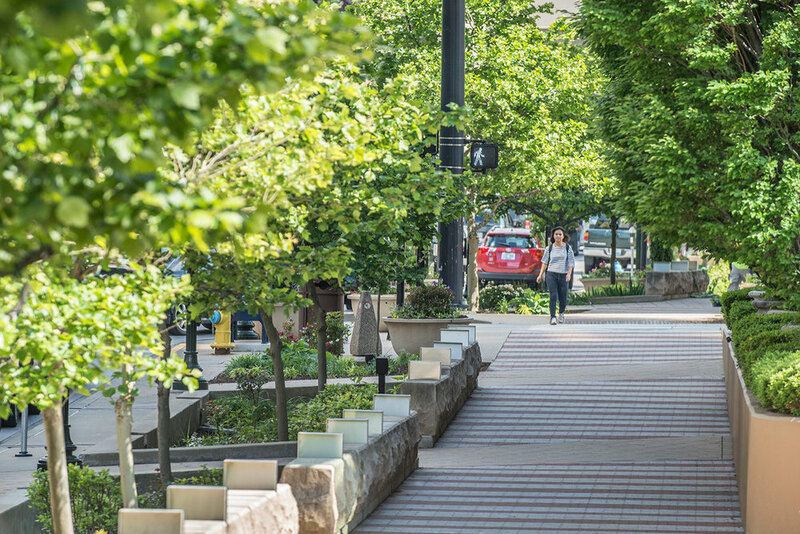 Street and sidewalk improvements have created stronger links to the University of Kentucky and Transylvania Campuses and introduced a more earth-friendly and sustainable infrastructure to downtown streets.